TL;DR - I'm writing a book about Growth Hacking. Here is the website. Hello to those who don't know me. I'm Jon, I run a SaaS company, we have a bunch of awesome customers, I love our product and use it myself every day. I've also started a couple of other companies in the past, one of which was acquired. In addition to this, I help mentor young startups. These days I talk to more and more early stage startups specifically about marketing and growth. Sometimes its on a formal basis - I'm a mentor with Singapore Management University and True Incube Thailand (a 500 Startups partner). Sometimes it's just someone who sent me an email or a friend who needs advice with a new project. I'm super happy to help whenever I can. So wherever possible, I try to do things that scale a bit better. Blog, speak at events, that kind of thing. I created the Growth Hacking 101 and Actionable Growth Hacking Tactics decks as a way of putting the advice I often give in a way that more can access. Between them these decks have been viewed over 100,000 times. Sure, that's no Sneezing Panda, but considering it's business / startup content, I've been pretty amazed at the response! Every day I'll get a tweet from someone thanking me for the decks. I'm flattered, especially since I think they are kind of scrappy - I put them together hastily and I think they are even a little hard to follow since they were created as part of a presentation where I talk through the slides. Since I'm a product guy, this kind of irks me. I'd love to create something useful like this but in a simple, elegant form that anyone can follow - even someone completely new to startups or marketing. Now it's time to take that step. I'm writing an ebook. It's called the Growth Hacking Handbook. 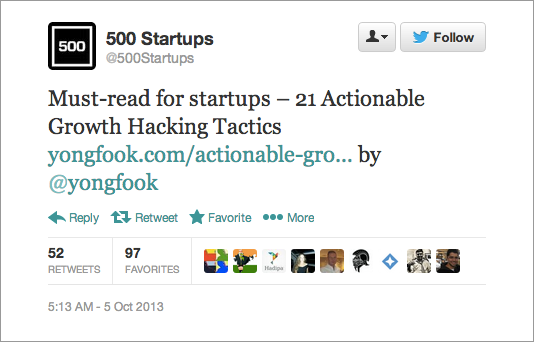 The Growth Hacking Handbook is the anti-marketing-book book. There's no stupid diagrams. No business doublespeak. No questionable theory. Just a collection of 100 growth tactics that countless startups over the last 20 years have used successfully. Try all the tactics, or just try a few. It doesn't matter - the point is, with this book there is nothing stopping you getting your startup marketing strategy off the ground. There's 100 different ways you can start, which leaves 99 ways you can continue. In true lean startup / crowdfunded style I'm launching the book as a crowdfunded project. In this day and age - why not? Launching in this way simultaneously validates the demand for the book while raising funds, which helps mitigate the risk of taking the time to write and polish the book. I'm estimating an April 2014 launch for the finished book. The funding goal is $10,000. Which is a fairly conservative 400 books. If there's not 400 people out there who want this book, then I won't write it (demand too low), and everyone will get refunded. Lets hope we can reach the funding goal in 30 days! I'm using the startup Publishizer to run my crowdfunding campaign. Thank you in advance to anyone who preorders the book. And if you have a twitter account, I'd really appreciate you sharing this website I made which explains the book in a quick and clear way!